John Fesko is interviewed at Christ the Center to discuss his new book The Rule of Love: Broken, Fulfilled, Applied. 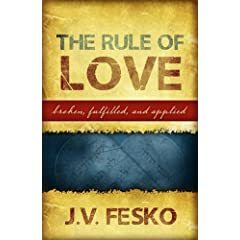 This book is a look at the 10 commandments from the perspective that they are not just rules, but that they are what an expression of a life of loving God will look like. A very fascinating subject. Kevin DeYoung is pastor of University Reformed Church in East Lansing Michigan. He has written numerous books that have been lauded by many well known evangelical leaders. These books include Just Do Something, Why We’re Not Emergent, and Why We Love the Church. Don Carson talks about how to prepare for expositional preaching through a biblical book. Carson is an excellent craftsman to follow and learn from. If you are a preacher or teacher this is one lecture you don’t want to miss. Carson delivered this at the 2003 Katoomba Christian Conference. The Unashamed Workman has a very nice time-stamped overview of Carson’s 12 main points.